Whitney Vickers | Greene County News A fire destroyed a home on the 1400 block of Glen View Road Aug. 24 in Yellow Springs. 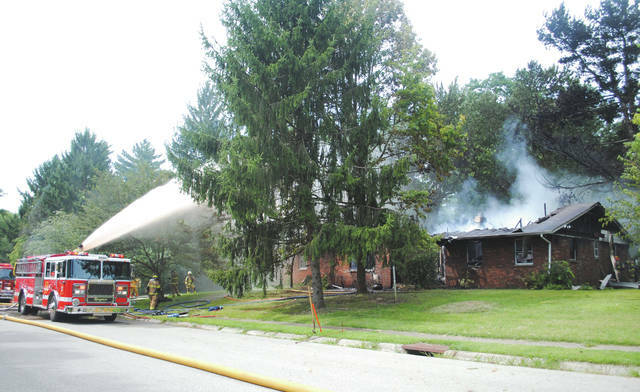 YELLOW SPRINGS — A fire on the 1400 block of Glen View Road in Yellow Springs Aug. 24 left one individual injured and another dead, according to witnesses. Scarlett Biggs said she and a friend were driving down the road when they noticed smoke coming from behind the home. They initially thought the homeowners were barbecuing when they realized that the house was on fire. Biggs said the driver then parked the car in the middle of the street and dialed 9-1-1 as they ran up to the front of the house. Biggs said the living room window had already cracked. They knocked on windows that were cool to the touch along the right side of the house until they heard someone yell “help.” They tried locating where the yelling was coming from when they made their way to the back of the house where a privacy fence is in place. By this time, Dr. Jeff Romig and his wife, Connie, heard the yelling and called 9-1-1. They made their way to the yard from their home next door. Biggs said the privacy fence locked from the inside, but she was able to hop over it where she found an elderly female crawling out from the back door. She added that the elderly female has trouble walking or standing. The female told Biggs and Romig that her grandson, a paraplegic who is unable to walk or talk, was still inside. Romig then soaked a sweater Biggs was wearing with a water hose, put it over his head and tried breaking into the house. He said he couldn’t get but a few feet inside because the smoke had created “a black wall.” He then smashed three windows to continue trying to rescue the male victim which caused smoke to billow out. Four other males in an unmarked painter van then rolled up to the scene and also tried to help, according to Biggs. Romig said he then went into the garage, where he tried getting the car outside to prevent an explosion. He was later told that the male victim was on oxygen tanks. Romig and Biggs said the elderly female kept trying to run back inside. She was later taken away on a stretcher in an emergency vehicle. One dog and one cat made it out, but according to Biggs and Romig, other pets did not make it out. Police and fire crews worked to treat victims and put the fire out. Fire crews included Miami Township Fire Rescue, Cedarville Township, Xenia Township and Hustead Township. Vectren and the Yellow Springs electric division was also spotted on scene. The Greene County Coroner was later called to the scene. The cause of the fire is unknown at this time. No other official information was available as of press time. The Herald will continue to report on the incident as information becomes available. 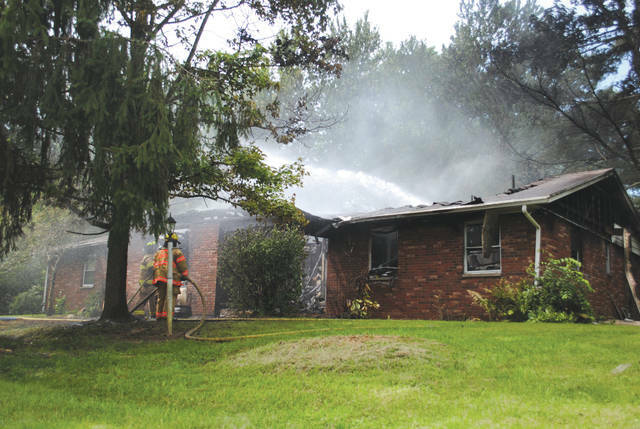 https://www.fairborndailyherald.com/wp-content/uploads/sites/50/2018/08/web1_ysfire4.jpgWhitney Vickers | Greene County News A fire destroyed a home on the 1400 block of Glen View Road Aug. 24 in Yellow Springs. 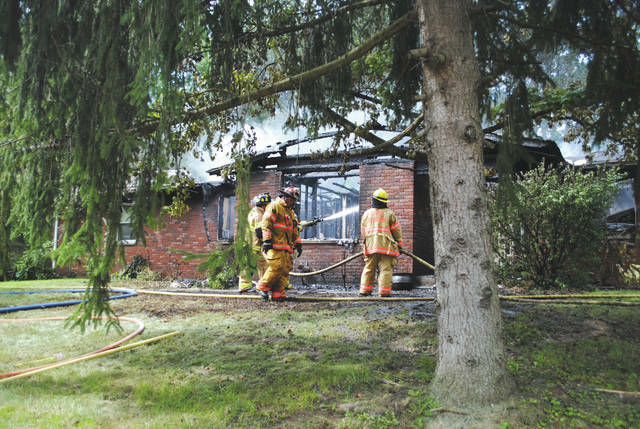 https://www.fairborndailyherald.com/wp-content/uploads/sites/50/2018/08/web1_ysfire1.jpgWhitney Vickers | Greene County News A fire destroyed a home on the 1400 block of Glen View Road Aug. 24 in Yellow Springs. https://www.fairborndailyherald.com/wp-content/uploads/sites/50/2018/08/web1_ysfire2.jpgWhitney Vickers | Greene County News A fire destroyed a home on the 1400 block of Glen View Road Aug. 24 in Yellow Springs. 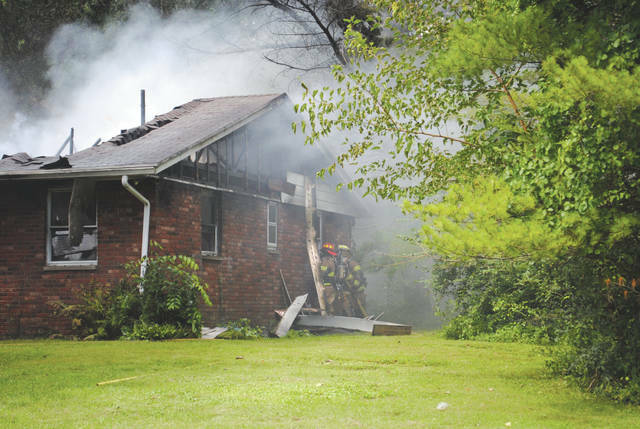 https://www.fairborndailyherald.com/wp-content/uploads/sites/50/2018/08/web1_ysfire3.jpgWhitney Vickers | Greene County News A fire destroyed a home on the 1400 block of Glen View Road Aug. 24 in Yellow Springs.